Losses due to fraudulent activities are particularly troublesome in the nonprofit sector because they directly reduce resources available to address tax-exempt purposes. The ensuing bad publicity may also reduce contributions and grants in subsequent periods. 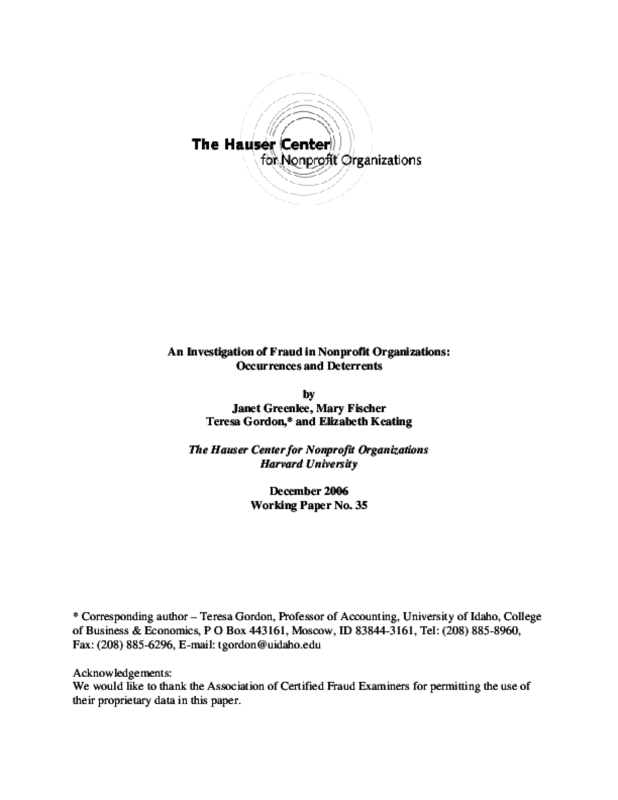 This paper uses data provided by Certified Fraud Examiners to report on the types of fraud they identified in nonprofit organizations and the characteristics of both the victims and the perpetrators of the fraudulent activities. Based on the analysis of the data, the authors suggest ways that fraud losses can be prevented or mitigated. In particular, governing boards are urged to consider important controls in addition to the annual financial statement audit. This publication is Hauser Center Working Paper No. 35. The Hauser Center Working Paper Series was launched during the summer of 2000. The Series enables the Hauser Center to share with a broad audience important works-in-progress written by Hauser Center scholars and researchers.